In the last article, we were introduced to GoFindXR, a revolutionary new platform that aimed to provide users with Extended Reality features in a decentralized digital environment(blockchain). GoFind offers its own Extended Reality Browser on iOS and Android smartphones. The app is a portal to access the XR Web easily and all the applications built on it. Remember that GoFind is focused on Real Estate and aims to apply extended reality (overlay digital content over real-world objects). This will allow users to remain connected to the real world and other people around them, while simultaneously experiencing virtual content. With GoFind you will be able to visit anywhere on the globe, explore exotic locations, purchase property on other continents, lease your property and get paid for it in tokens. WHATS TO GAIN FROM GOFIND? GoFind encourages and welcomes users and investors to be a part of this revolutionary advancement in communication and global interaction. GoFind is offering investors, users, and developers a global platform where their activity is rewarded with quality incentive. Early birds get the advantage of course. Think of it as the gold rush, or you getting the scoop about a large region of land that's about to shoot up in value. Advertisers can place ads in XR Estate and developers can collect fees and payments. 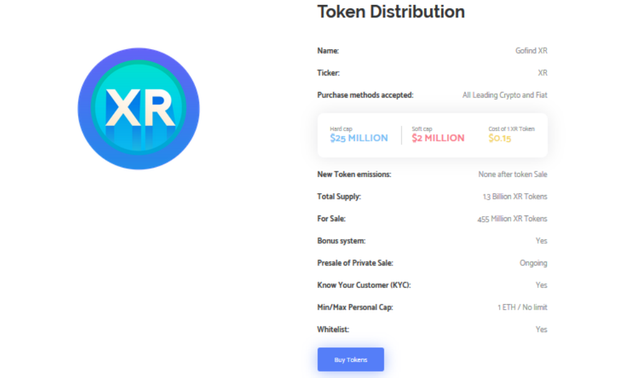 A percentage of these revenues are shared with the XR token holders. XR Developers, however, get tokens from XR VC Fund (24% allocation) by building XR apps. The Gofind XR economy is powered by XR Token. This ERC-20 token will power the ecosystem as it will be used to register land and trade on the marketplace. The purpose of this token is to allow users to create real economic value in a parallel world, and move that value between Gofind XR and the real world, as they please. Tokens are available on public and private token sales. After the sale, tokens will be available only on exchanges. You can visit the GoFindXR ICO page for more information. You will be prompted to Signup and will receive a confirmation email with a link to Access Your Account. After this, you will be able to login. You can buy XR tokens with Bitcoin, Ethereum or your credit cards. A 15% bonus is available for all purchases made between Feb 7th and April 30th. Hurry now! GOFIND IS OFFERING A STEEMIT SPECIAL! GoFindXR has partnered with Steem and Oracle-D to provide the Extended Reality experience on the blockchain. In the next article, we shall look at how to use the GoFind apps and getting around on the digital map..
To find out more, visit the GoFindXR website. You can also read the GoFind whitepaper here or read the Onepager. Their social media accounts are always active with members of the team ready to answer your questions. The information contained within this post is not to be taken as financial advice. I am not a financial advisor and none of your investment decisions should be carried out based on any information presented here. Please do you own research before investing in cryptocurrencies or any digital asset. You can lose all of your money by investing wrongly. The information presented in this article is for educational and entertainment purposes only. Another great review buddy. You definetly have a writing talent. I realized lately that my interest with ICO is very low and I don't believe in any new project any more. But I still wish GoFindXR all the best. Did you write this review because of some contest? just curious. No, no contest. I reviewed it. It's pretty dope. Like the real estate project we discussed last year. This one uses geolocation and software mapping. Kinda like the Pokemon Go game.